Happy Birthday to me! Another year has rolled over. This time last year I was still adjusting to living by myself here. I've done lots of thinking over the past year, but am not about to share my inmost thoughts out in public. I enjoy it here, there are places I would rather live, like the country or the mountains, but they are not practical and here is fine. If I lived further away, I would not have surprises like yesterday. We had planned on an outing to the zoo as a birthday outing. It's twelve years since I was there. However, various family members were away, so we cancelled the zoo. I felt miserable yesterday, my hip had been really painful the day before and while it was better yesterday, I still felt down. Then just before noon, in walked youngest son and his two children. Their mum was working. He had brought food, stuff to BBQ and some drinks. A heavy load to carry in train from Central Coast. Not long after, his eldest brother arrived with gifts, more food, good bread and some cheeses. His wife is on a trip to Sri Lanka for a children's charity. 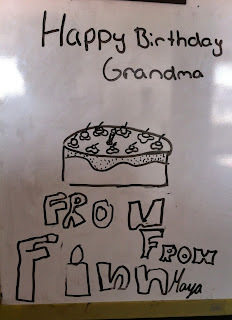 Miss 12 set to straight away and made me a birthday cake which you can see. I had to show her how to use my Kitchenaid, but after that she did everything herself. Her brother who turned seven last month got out my vacuum cleaner, assembled it himself and went through the place. He likes cleaning but is not allowed to touch their very expensive Kirby machine, so he does mine when down here. He even lay on his stomach and vacuumed under the lounge. It was only a few days since I had done it, but who wants to squash a willing worker? Miss 12 cleaned off the messages from her cousins which had been on my magnetic board for weeks and spent some time drawing. When her brother saw it, he added his name and a "from" in front of her name too. He's just worked out how to do this outline double lettering. His name rather dwarfs his sister's and she was a bit put out. We had a lovely meal and it was altogether a very pleasant afternoon. Eldest son ran his brother to the station and they nicely caught a train home, just before the football crowds descended on the station to make getting a seat difficult. I felt ever so much better, this was a real lift. 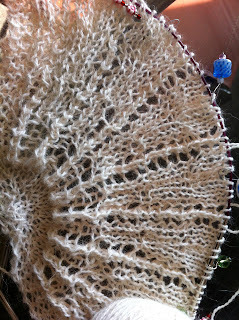 Now this is a knitting blog.... A few months ago, I bought two mystery shawl patterns. I completed the Fellowship shawl but wasn't happy with it and undid it all. This was due to a couple of things. I don't think the wool I chose was really suitable, although it's lovely and I like it very much. The shawl was based on Elizabeth Zimmermann's pi shawl and did the doubling of the stitches as she suggested. It was to be a semi-circular shawl but the doubling every few rows mad the edge line bumpy. 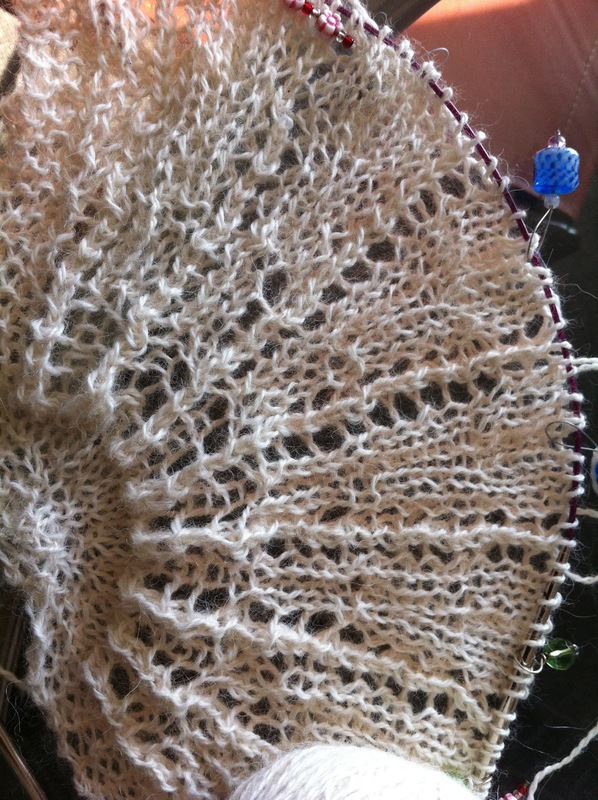 The second shawl is also a semi-circular, but more thought has been put into the actual design. It will be the right shape but the increases are staggered and the whole thing looks much better than the first. I'm halfway through the third clue out of five. This is the Garn Studio baby alpaca. Its's laceweight and light as a feather. Very soft indeed. The patter, at least so far , is logical and easy to follow and I'm happy with it. The shawl will be soft and squishy and warm, particularly if used as as scarf with triangle main part at the front of the throat. Just as I was about to finish, middle son has rung to wish me happy birthday. He's down at Perisher Valley with my eldest grandchild. He loves the snow and hasn't been for some years. This was all paid for months ago before he lost his job, so he was still able to go this year. He starts new job next week, I think. Happy birthday! Shame about the Zoo, but what a lovely day you had instead! And little cleaners and cake bakers as well, sounds perfect to me! Happy birthday, Jan. What wonderful sons and what a lovely surprise! Happy birthday Jan!! What a lovely surprise for your family to come and then entertain you and bake a cake.. I laughed at Finn's big name and the vacuuming!!! I am glad you had a nice day. Is that wool the one from the post about the knot?? I am sad you were unhappy with the Fellowship shawl but once you are not satisfied there is no fixing it. The new one looks very good so far.